Plate 1. Melodious Warbler, Mercote Mill, West Midlands, June 2015. On June l1th, 2015, I heard an unfamiliar song coming from a bird hidden within an area of rank vegetation, saplings and gorse near Mercote Mill, NW of Berkswell, in the West Midlands. 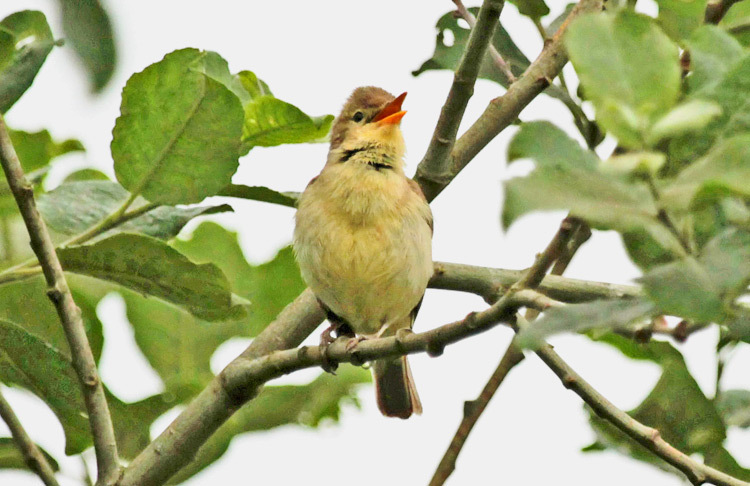 The song was remarkable for its variety and mimicry of other species, characters which are most frequently associated with Marsh Warbler's song. Could it be that species perhaps? Unfortunately, such conjecture was confined to song as, for the next half-an-hour, the songster remained hidden in dense vegetation, with a briefly glimpsed silhouette confirming only a relatively long bill. During this time, however, I obtained several sound-recordings and also notified others of the bird's presence. At last the warbler began to show itself. Nick Barlow (on a 'flying visit' owing to business commitments) obtained a brief sighting but sufficient to reveal a yellow suffusion to the underparts, indicating a Hippolais species. A small group of observers then obtained more prolonged views. Additionally, Andy Hales had a bird songs 'app' on his mobile device while several of us acquired the first photographs. Finally, with structural, plumage and vocal features all determined, we were able to establish the identity unequivocally: it was a Melodious Warbler! The following characters provided a firm diagnosis: upperparts olive-brown, underparts with distinct yellow suffusion; bill broad-based and lower mandible entirely pale, with a distinct orange hue; tip of tail square-cut; primary projection two-thirds the length of the exposed tertials; lores pale close to the eye (though in brief views a prominent gape-line could be confusing); legs brownish-grey (though with distinct flesh-pink tinge when viewed in bright light); wings relatively plain (no prominent pale panel); consultation of a range of candidate species on bird songs 'app' confirmed that Melodious was a good match. 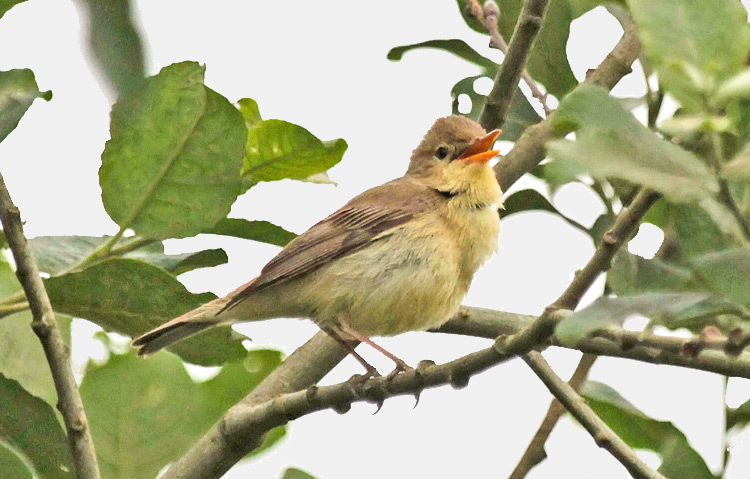 Intriguingly, when the songs of Icterine Warbler, Melodious Warbler and Marsh Warbler were being consulted on a mobile device, the bird reacted strongly when the song of Marsh Warbler was played, flying out to the top of a bush and then flying towards the source of the sound. Was this a 'delayed reaction' prompted by the earlier Melodious recording, or is the species alert to any 'mimetic' style of song? Although elusive at times on its day of discovery (with some observers waiting over an hour before achieving views), from June 12th it began to exhibit markedly territorial behaviour. It established preferred (and predictable) song posts in two small trees, with the upper branches of a Sallow especially favoured. Its features were now well displayed and were captured in detail by a plethora of visiting photographers (see my own images in Plate 1 above and Plates 2, 3 & 7 below and the excellent images by Mark Priest in Plates 4 to 6). It remained in the same small area and in vigorous song until July 9th. It was not seen on July 10th, despite the continuous presence of would-be observers. Surprisingly, it was reported again (for the last time) on July 11th, when it was stated to have been heard calling but not in song. This was only the third record of Melodious Warbler for the West Midlands region - following others at Newcastle-under-Lyme, Staffs, in May 1996 and a bird trapped at Brandon Marsh, Warks, in June 2000. It is the first for the metropolitan county of 'West Midlands' and further confirmation of the productivity of the area in and around the nearby Marsh Lane NR. With more than 35 years elapsed since I had heard Melodious Warbler in song, this bird provided a welcome refresher course. There were several Whitethroats singing in the Mercote Mill area, to which elements of the Melodious Warbler's song had some resemblance, though more fluid, less grating and much more prolonged, producing a cascade of rapidly delivered notes which also loosely recalled Skylark song. However, as well as this core element, the song was notable for its variety, with extraordinary changes in note structure, speed of delivery, timbre and pitch. As well as Whitethroat song, one sequence of notes resembled the 'churring' alarm call of that species. Other variations recalled the vocalisations of Goldfinch, the alarm-calls of Blackbird and the contact call of Chiffchaff. 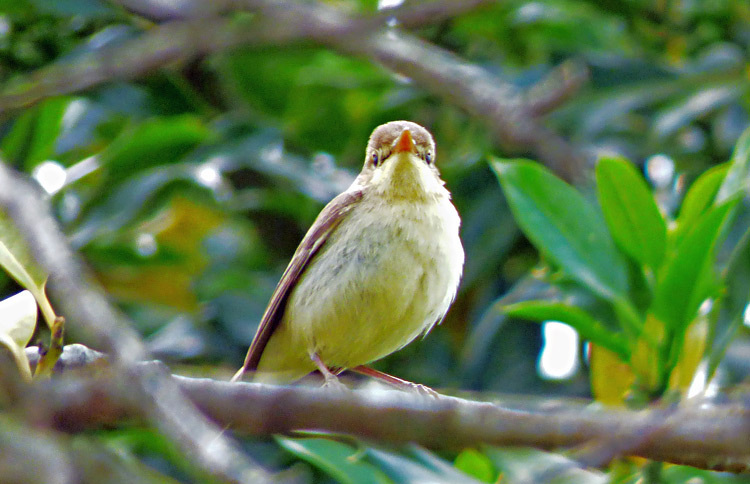 A recording of the most frequent song-style of the Melodious Warbler at Mercote Mill can be heard <here>. The two sequences illustrate the regular rather Whitethroat-like stanzas, introduced here by staccato series of notes loosely recalling Swallow and House Sparrow, respectively. A sequence of song illustrating the wide range of variation can be heard <here>. This sequence begins with a churring series of notes recalling a Whitethroat alarm call or an Acrocephalus. This is followed without pause by a series of Goldfinch-like notes, then a section recalling Whitethroat song; then a series of notes resembling Blackbird alarm-calls, and finally a clear fluted note somewhat like the 'hweet' call of Chiffchaff. A sonogram of this sequence is portrayed in Figure 1. Figure 1. Sonogram of song of Melodious Warbler, Mercote Mill, West Midlands, June 2015. Sections recalling the vocalisations of other species are captioned. The sonogram in Figure1 illustrates vividly the remarkable variety of notes and the abrupt changes in style. Sometimes a series of notes resembling Chiffchaff's contact call were concatenated at the start of a song sequence and sounded very like the intensive call series often employed by that species. An example can be heard <here>, with the corresponding sonogram in Figure 2. Figure 2. Sonogram of song of Melodious Warbler, Mercote Mill, West Midlands, June 2015. Section recalling call of Chiffchaff is captioned. Collins Bird Guide (Svensson et al. 2009) and Lars Jonsson's Birds of Europe, with North Africa and the Middle East (1992) both note that more-mimetic Melodious song can recall that of Marsh Warbler. It is this variety and the apparent tendency towards mimicry which raise thoughts of Marsh Warbler, though sound recordings confirm that most Marsh Warblers have a rather slower, more tuneful and less frenetic delivery, with even wider variety and more frequent changes of style (indeed, it is Marsh Warbler which has generally the more melodious song!). Examination of recordings on the website xeno-canto illustrates the greater variability of Marsh Warbler's song. Individual songsters imitate many more species and, accordingly, the range of notes and the speed of delivery vary more widely, with a tendency to include distinctively 'liquid' and 'pure' sounding notes. However, it is not difficult to find recordings which resemble Melodious Warbler in their pace, rhythm and general character. 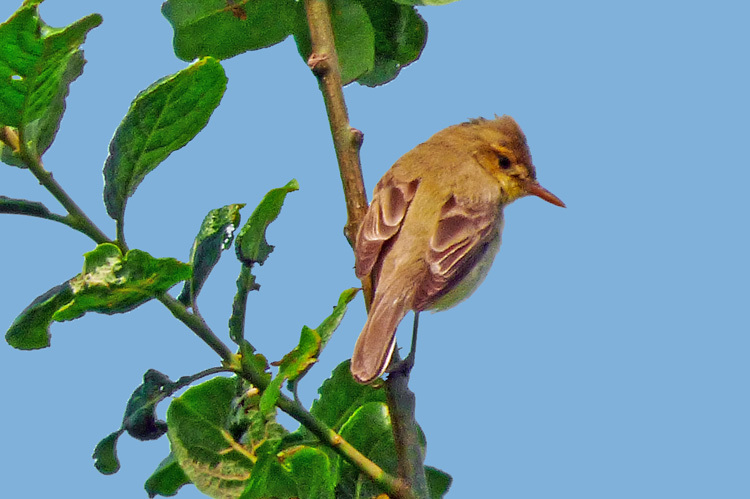 An example is a Marsh Warbler recorded in Denmark in June 2014 by Louis A. Hansen (xeno-canto XC209155). 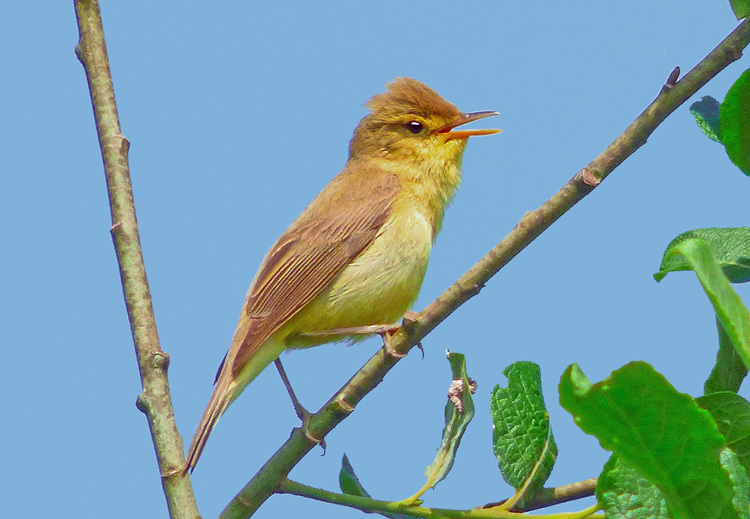 The song of the Mercote Mill Melodious Warbler and an extract from the song of this Danish Marsh Warbler are compared <here>. Plate 1 in the header and the images in the following gallery portray key features of the Melodious Warbler at Mercote Mill. I am grateful to Mark Priest for the images in plates 4 to 6. Other images can be viewed via the website of The West Midland Bird Club while many further images have appeared on internet sites such as Birdguides. With around 100 images published on the internet, it is surely one of the most photographed Melodious Warblers ever in the UK. It is interesting, though, to note the variation in appearance conveyed by this large series of photos. Most are admirably sharp and convey well the overall character of the bird. A high proportion also capture well the distinctive colour-balance, with its evident yellow hue on the underparts and its more subtle but generally observable olive tinge to the upperparts. However, some published images convey a distinctly different colour-balance, with much reduced yellow and olive and a greyer appearance overall. While the appearance of the bird in the field certainly varied with the light conditions, the variation among published photographs certainly exceeds quite significantly the true level of variation. This is primarily a result of camera 'white balance' and exposure compensation, especially when taking photos against a bright sky. Some of my own images suffered from this effect, with a much greyer appearance than supported by observation in the field at the time. The following images have been selected to convey key features in conjunction with a colour balance representative of the enduring appearance in the field. Plate 2. Melodious Warbler, Mercote Mill, West Midlands, June 2015. Note general shape and structure, including prominent bill, raised crown feathers and length of primary projection. Upperparts have evident olive tinge. Wings generally appeared relatively plain but, when viewed from the rear as here, pale fringes to tertials and secondaries apparent. Plate 3. 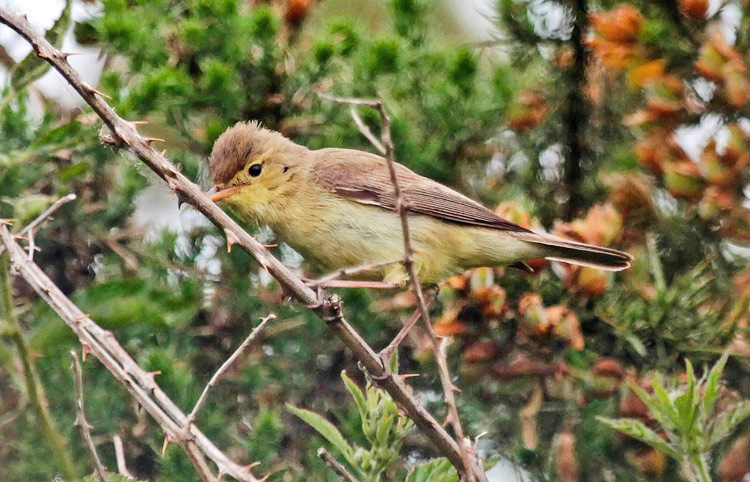 Melodious Warbler, Mercote Mill, West Midlands, June 2015.
which presumably results from the influence of blood vessels in certain light conditions. Plate 4. Melodious Warbler, Mercote Mill, West Midlands, June 2015. Note the broad base to the bill and the strikingly orange lower mandible. The tail is square-cut at the tip. There is an evident yellow hue to the underparts while the legs show their 'natural' grey hue. Plate 5. Melodious Warbler, Mercote Mill, West Midlands, June 2015. (though narrow pale fringes to tertials and secondaries were visible when bird viewed from behind - see Plate 2). The prominent gape line extends back under the eye. Plate 6. Melodious Warbler, Mercote Mill, West Midlands, June 2015.
but are perhaps already showing signs of wear. In this image the legs have a grey ground-colour but there is a strong pink tinge.